Version 2.1.1 adds Preliminary VAPI and PRO image support. There was an issue with the 2.1 disk image containing an old version. 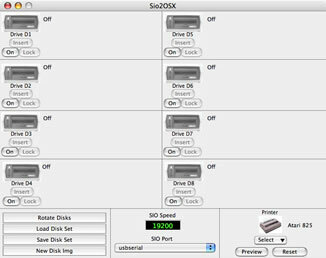 Sio2OSX is a peripheral emulator for the Atari 8-bit computers that allows the Atari computer to use an OSX based Macintosh as a disk drive, a cassette drive, and a printer. Sio2OSX peforms functions similar to APE or SIO2PC on Windows based computers. Sio2OSX is a shareware program, and must be registered for full operation. The unregistered version of the program will run for 5 minutes before quiting, allowing you to verify operation with your hardware setup before purchase. The software can be easily registered for $25 through Kagi (follow this link). A full manual is included within the application's Help menu. Note, as this does require serial USB hardware, and is a new product, please try it out on your hardware before you pay the registration fee. I'll be glad to answer any questions you might have by email. The second requirement for Sio2OSX is a Sio2PC cable to connect the Atari to the Mac. There are several plans on the internet for building such a cable, but currently there are also serveral sources of prebuilt cables. Sio2OSX has been tested with cables/adapters from two of these sources. The first of the sources is located in the US, and here is the link to purchase this adapter: Atarimax Adapter The second source is located in Poland, and here is the link to purchase this cable: Sio2PC Cable. Both of these cable/adapter providers also sell their products on Ebay. The final requirement of Sio2OSX is a serial port to plug the Sio2PC cable into. As modern Macintosh computers do not have a built in serial port, the only relastic option is a USB to Serial dongle. However, most of these will not work with a Sio2PC cable. This is due to the fact that the modem control lines that the Sio2PC cable uses to signal commands from the Atari (RI or DSR) are either delayed in reception from the USB Serial driver, or not reported at all, and therefore commands from the Atari are not recognized. The only type of adapter tested and known to work with the Sio2OSX is one made by the company FTDI (www.ftdichip.com). A known source of these adapters is USB Gear, and a link to the one that the author uses is: USB to Serial Dongle. From beta testing, it is also known that it is important to have the correct version of the drivers for the dongle as well. They are available here, on FTDI's web page. The latest driver from FTDI is version 2.1.7 for PPC and 2.2.7 for Intel from this page. 2.1 - Added support of VAPI copy-protected disk images. This does not yet enable all images, but perhaps 90%. If the VAPI dll source is ever released, this number may be increased. 2.0 - Added 850 Emulation to allow Internet Modem capability and the ability to connect serial devices. Added the ability to swap disks between any two drives by holding the option key while dragging a disk from one drive to another. 1.2 - Universal Binary version. 1.1 - Fixed program expiration bug, and bug in formating large hard disk images.